Canyon Lake is one of four reservoirs that were formed by the damming of the salt river. Canyon lake is the third lake downstream on the Salt River Chain of Lakes. The Lake was formed by the Mormon Flat Dam which was completed in 1925. Canyon is the smallest lake of the 4 lakes in the Salt River Chain. The lake is approximately 51 miles east of Phoenix Arizona, and is within the Superstition Wilderness of the Tonto National Forest. The winding and scenic drive through the tall rock canyons have several stop off points to take pictures. Canyon Lake also holds the Arizona State record Largemouth Bass at 16.7 lbs, which was caught in 1997. Additional lake activities include jetski, sailboat, and kayak rentals. There is also tent or RV areas for overnight lodging at several campgrounds, which are close to beaches for day use swimming or wading. DEPARTURE TIME Varies depending on trip booking. Meeting at boat ramp. RETURN TIME To be determined. WEAR Comfortable clothing, athletic shoes or flip flops, hat, jacket and sunscreen. 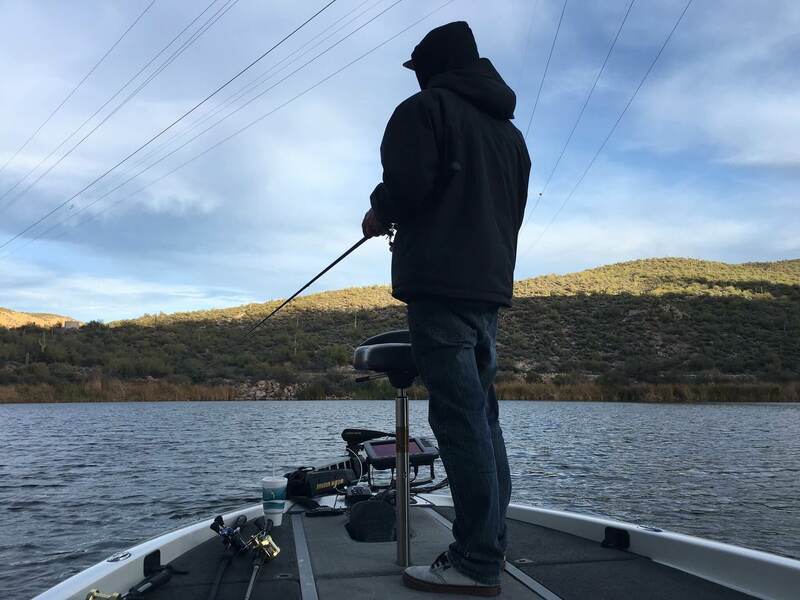 View out other fishing guide trips on Roosevelt Lake and Saguaro Lake. 9/17/2018- Great day of fishing with Mike on Canyon Lake. Mike is the bomb. He really wants his clients to catch a fish of a lifetime. Mike knows the lake like the back of his hand and put us on some nice fish. I caught the biggest bass of my life. (7 lbs). Mike’s boat is top notch and he has all of the latest equipment necessary for a day of fishing. Canyon Lake has gorgeous scenery which is just icing on the cake. I am sure Jason treats his clients just like Mike does.